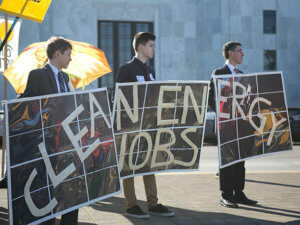 From left: Students Jeremy Clark and Charlie Abrams stand with Chris Clark during the February 2018 Day of Action in Salem in support of the Clean Energy Jobs bill. The Oregon Legislature now sits as the third in the nation with a legislative committee charged with reducing climate pollution to protect our children, families and health from climate change. 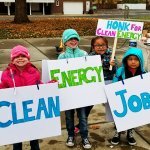 Thanks to your help, our leaders have noticed the strong public support for the Clean Energy Jobs bill, which caps pollution from the largest emitters in the state. The momentum is strong and needs to remain so. After the 2018 Legislative Session, state leaders created the Joint Committee on Carbon Reduction, led by the majority leaders of both chambers. The Governor’s Office has staffed the newly formed Carbon Policy Office. And this May, our elected leaders reconvened to restart discussions on passing the Clean Energy Jobs bill. Now’s the chance to weigh in and say this bill should remain a top priority for 2019. Proceeds from a price on carbon will help our most climate-impacted neighborhoods, our workforce, especially those who work outdoors, and our economy. Investments can be made for the benefit of agriculture and rural communities, while also encouraging the development of smart carbon-reduction strategies. 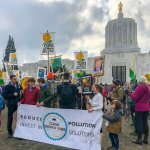 Our state needs to continue on a path that delivers clean energy as we transition away from polluting fuels and technology.We ask that you continue to show support for this crucial legislation and maintain pressure for the strongest, most environmentally-sound version of the Clean Energy Jobs bill to reach the House and Senate floors in 2019. All our legislators from every corner of the state need to hear that Oregonians demand smart policies that pivot us to lead the nation with a clean-energy economy. Now’s the time. In the face of federal action aimed at maiming environmental standards in order to favor major polluters instead of our communities, it’s up to us and our state leaders to maintain the integrity of air and water protections. We’ve created a tool that gives you suggested language as you personalize your message to your leaders. Please take a moment to reach out to your state representative and senator. 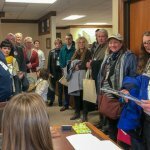 We will provide live Tweets during the committee’s hearing scheduled to begin at noon and look to OEConline.org/Climate for more information on the bill and our work to protect the climate. Thank you for your advocacy and remaining a strong supporter. 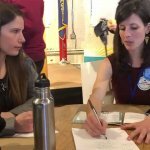 1 Reply to "Call to action: Let’s keep the Clean Energy Jobs momentum going strong"